Mother Goose gets a makeover in this vibrant new collection of childhood classics. 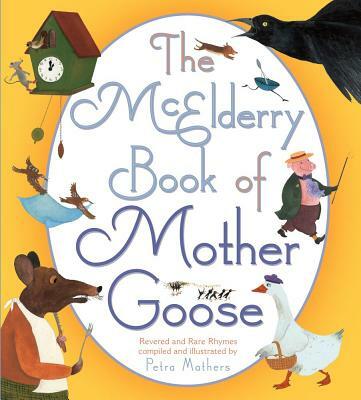 This innovative Mother Goose collection combines family favorites with less well-known rhymes in a bright, new package. Here Little Miss Muffet and her tuffet meet Gregory Griggs and his twenty-seven wigs, and the cat and the fiddle are not the only music-makers—there’s also Terrence McDiddler the Three-Stringed Fiddler. From “Hickory, Dickory Dock” to “Higgelty, Piggelty Pop,” Petra Mathers and her vivid, quirky illustrations capture the timeless joy and cleverness that are inherently Mother Goose. This modern collection of Mother Goose classics promises to enchant and delight a new generation of nursery rhyme readers.